De Koffie Pot are keen to find more speakers for their own Wednesday evening slots as part of the Politics Ethics and Environment series. And HGN are also always on the look out for more speakers. Anyone who would like to speak or join a panel as part of these upbeat interactive evening sessions please let Kate know and I’ll also pass on your details to Nat at DKP. Wednesday 16th August, 7.30 – 9pm – How Do People Transform? with Jon Dover. An exciting glimpse at the transformational ‘Integral’ theory. Wednesday 20th September, 7.30 – 9pm – Love Your Bus! With speakers and bus activists from around the county. An encouraging link sent over by Gareth Williams from Caplor Energy… Perhaps change might appear over the horizon of the Conservative Government’s ban of on-shore wind. The results of the consultation and the stalwart efforts of Rail & Bus for Herefordshire (RBfH) volunteers handing out leaflets on the proposed cuts to bus services took the Council by surprise. The response to the consultation was one of the biggest they had which served to emphasise the importance of buses in both the social and economic well being of this rural county. The result was a postponement of the cuts proposed for 2017. However, the sting is in the tail as it is still on record that the council will seek to progressively reduce the bus support budget to nil over three years. What is equally as disturbing is that operators are beginning to prune their commercial services, albeit on a small scale at the moment. This is indicative of the dire straights that some operators are finding themselves in without support, and not necessarily financial support from the local authority. 3. 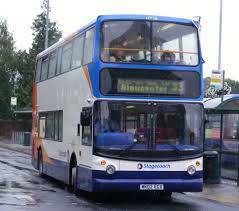 That it needs to accept that Community Transport cannot make up for the loss of mainstream routes in some areas. An interesting point, however, that Herefordshire council have gone out to tender on eight contracts due for renewal in September 2017. The contracts involved are those for the main Hereford-Kington service and services in eastern Herefordshire operated by Astons coaches and DRMBus. Further, the contracts for eastern Herefordshire are issued individually but also as a combined contract with the title of Ledbury Area Services. One presumes that the council are hoping such an area approach where contracts can be linked using the same bus will lead to discounted prices from operators. The results are still awaited so we will have to wait and see. In the meantime RBfH urge you to write to the Portfolio Holder for Transport, Councillor Durkin at bdurkin@herefordshire.gov.uk, together with your local councillors to seek assurance that the network of routes to our main rural settlements are maintained in the future. Places which have populations of approximately 700-1000 deserve a service. These are places such as Bosbury, Canon Pyon, Colwall, Cradley, Eardisland, Eardisley, Hoarwithy, Kingsland, Leintwardine, Pembridge, Peterchurch, Shobdon, Staunton-on-Wye, Tillington, and Wigmore. Their services all remain at risk! Last month Herefordshire Green Network supported the showing of the film ‘Tomorrow’ at the Courtyard. Around 100 people attended, and the film showing was followed by a lively discussion about how local people can get more involved in local energy saving projects and activities. On Wednesday evening this week the Herefordshire Green Network are hosting a follow up to this discussion. Join HGN member organisation New Leaf and hear about how to get involved with projects that are currently part of their local portfolio. The evening will include a session on idea generation and skill sharing with an invitation to everyone to take part. New Leaf Sustainable Development are a not-for-profit co-operative who have been active in Herefordshire since 2010 on a range of awareness raising and energy saving projects. The New Leaf approach to community engagement is upbeat and inclusive, and frequently employs a combination of arts and technology in a holistic approach to mindset change. The HGN Gathering is on the 19th July, 7.30pm at De Koffie Pot, Left Bank, Hereford and is open to everyone. Or join us early at 6pm for an hour of singing simple and inspiring songs with the Turnastone Peace Choir. More information on our Whats On pages. Herefordshire is a diverse agricultural county – hops, yoghurt, beef, apples, cheese, chickens, strawberries, pork, asparagus, lamb – you name it, we grow it. And council-owned farms are the only means by which ordinary people have a hope of getting a foot on the farming ladder. However the livelihoods and homes of almost 50 tenant farmers and their families are immediately at stake, as well as the future farming careers of generations to come. Local political party Its Our County are making a legal challenge to Herefordshire Council over the sale of their farms estate. The Pomona Solar Electric Tractor! Gordon Coppock shared an image last week of Pomona Solar just after he had finished mowing at Stoke Edith with the electric tractor. In future the group coordinating this community owned solar array may be looking for people who would like to scythe and remove the hay from the centre sections of the array site. The site was originally planted up with a seed mix and some of the growth is deliberately being left uncut to encourage diversity of habitats. For more about Pomona Solar – or to get in touch with Gordon – click here.